Today is your last chance to see the inaugural special exhibit, In Pursuit of Emancipation: Documenting Lincoln’s Decision to Proclaim Freedom, at President Lincoln’s Cottage. The exhibit closes its doors today at 5:30pm after a 3 month run. The exhibit was featured in pre-opening events and was opened to the public as part of the Grand Opening Ceremony on February 18th. This exhibition features over a dozen manuscripts and artifacts on loan from The Gilder Lehrman Institute of American History, The Massachusetts Historical Society, and The National Museum of American History Smithsonian Institution. 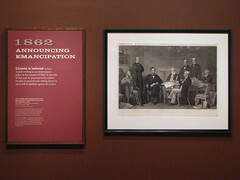 Highlights include the pen Lincoln used to sign the Proclamation, a rare autographed copy of the Emancipation Proclamation, and one of 13 souvenir copies of the 13th Amendment, signed by Lincoln. Notable visitors to the exhibit include the First Lady of South Korea, and Congressman Roy Blunt, the House Whip. In combing through a Christian Advocate dated Oct. 29, 1885, I came across an article that the pen used by Lincoln to sign the Emancipation Proclamation was burgled from the residence of Claude J. Adams of Chicago. There is also a NY Times article online with a good quote from Mr. Adams, but I cannot find how or when the pen was recovered. Can you share the story? But if Lincoln gave the pen to Livermore, what pen did Mr. and Mrs. Adams own? I noticed the NY Times published a follow-up article November 13, 1885 that claims the burglar mailed the pen to the Times for them to restore it to Mrs. Adams, so presumably she got the pen fairly quickly. Both NY Times articles contain an interesting bit of info: Mrs. Lincoln gave the pen to Mrs. Adams. First, let’s assume the NY Times articles are accurate. Second, let’s give the Adamses the benefit of the doubt and assume they’re telling the truth: Mary Lincoln gave Mrs. Adams a pen that Mary claimed her husband used to sign the Proclamation. It’s certainly plausible Mary gave Mrs. Adams a pen. After President Lincoln’s death, Mary gave away many of his possessions to family, friends, colleagues, and acquaintances. Given the provenance of the pen owned by Massachusetts Historical, it would seem the most likely explanation for the pen Mary supposedly gave to the Adamses is that Mary misidentified the pen. Alternatively, perhaps it was a pen Lincoln used to sign something, just not the official copy of the Emancipation Proclamation.